UNICLAMP Columns and Clamps provide a convenient, rugged means of supporting light mechanisms without the use of weldments. By combining various UNICLAMP Fittings virtually any mounting position and compound angle can be achieved. UNICLAMP Fittings are available in two sizes, one series for attaching to 7/8″ diameter columns and the other for attaching to 1 ¾” diameter columns. UNIGRIP Air Control Valves are very compact, miniaturized valves made of brass and stainless steel. The tapered male threads provide two distinct advantages: the valves can be oriented 360° in mounting and, since there is no undercut at the base of the threads, the problem of the bodies snapping off is eliminated. 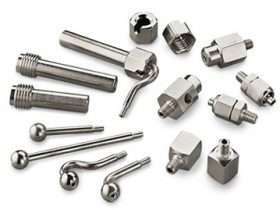 The air flow through the valves is adjusted with the hex socket wrench – an easy tamper-proof adjustment. UNIGRIP Fittings for plastic tubing have a number of advantages over other tube fittings. One important advantage is that they are easier to assemble and disconnect. The tube is easily pushed onto the taper and the nut need only be finger-tight to create and air-tight seal on soft tubing. The tubing is easily removed from the tapered body without cutting the tube. UNIGRIP Fittings have a simple, two-piece construction requiring no gasket or compression sleeve. The fitting does not create undue tension on the tubing. UNIGRIP Fittings are usable with any soft tubing with ¼” O.D., 1/8″ I.D. The # 10-32 tapered male thread allows 360° orientation of fee and cross type fittings and is designed for use with standard straight # 10-32 female threads. The tapered thread is stronger since there is no undercut at the base of the thread. UNIGRIP Fittings for plastic tubing can be used interchangeably with most other fittings on new or existing equipment.